This is my mother’s original “Keema Curry” recipe which she made for us as kids when we couldn’t handle spicy food. It is a little different from authentic Keema Curry, but its great for the whole family. We label this dish as a “Dry Curry” in Japanese because there is no soup. “Keema Curry” basically means a curry dish using ground meat. In Japan, Curry is very popular especially among kids because we can eat it with steamed rice. I used “Curry Powder.” The ingredients in the powder are: paprika, garlic, ginger, cumin, coriander, black pepper, cayenne pepper, cinnamon, cardamom, cloves, and saffron. It is very nutritious and is high in vitamin E, vitamin K, iron, beta-carotene, potassium, magnesium and so on. These helps increase our metabolism and also have antioxidant properties. Additionally, this dish is great for mothers and fathers who have children who are picky eaters because you can mince and add various vegetables and cook with ground meat. The curry taste helps cover the taste of most vegetables so even picky eaters can get a lot of good nutrition. Enjoy this curry dish with steamed rice or your favorite bread! Categories: Curry | Tags: antioxidant effects, beta-carotene, Carrot, Chicken, curry powder, Delicious, Eggplant, Healthy, iron, magnesium, metabolism, Nutrition, Onion, potassium, protein, recipe, rice, Vegetable, vitamin E, Vitamin K | Permalink. Today I am going to tell you about Natto which is a traditional Japanese SUPER FOOD. It is made by fermenting soybeans with Bacillus subtilis var. Natto. The taste of Natto itself comes from the soybean. We stir and drizzle Natto with Dashi stock and soy sauce when we eat so it tastes really good with steamed rice. it has a gooey texture and threads a lot when stirred, and it also has an ammonical smell. Therefore, most Japanese is really love it, but some people don’t like it, especially the smell. However, Natto is incredibly nutritious and there is one kind of nutrition, Nattokinase (an enzyme) we can get only from Natto. Nattokinase is an enzyme. This enzyme is very important catalyser for human digestion after ingesting food. Nattokinase has also been known to dissolve blood clots. Natto is high in Vitamin K and good-quality protein. Vitamin K leads to activation of protein. Low vitamin K may cause osteoporosis and arteriosclerosis. Foods containing high vitamin K other than Natto are sea weed, parsley and spinach. Natto’s fiber and Bacillus subtilis var. 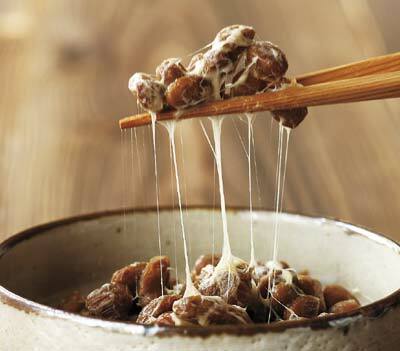 Natto are probiotics so Natto improves our intestines environment which has a huge effect on our immune system. Many studies show Natto sterilizes Escherichia coli and Salmonella. In the pre-antibiotic era, Natto was used as a medicine for some epidemics. Dipicolinic acid that is contained in Natto has high antibacterial effects on Streptococcus pyogenes, Escherichia coil and Vibrio. 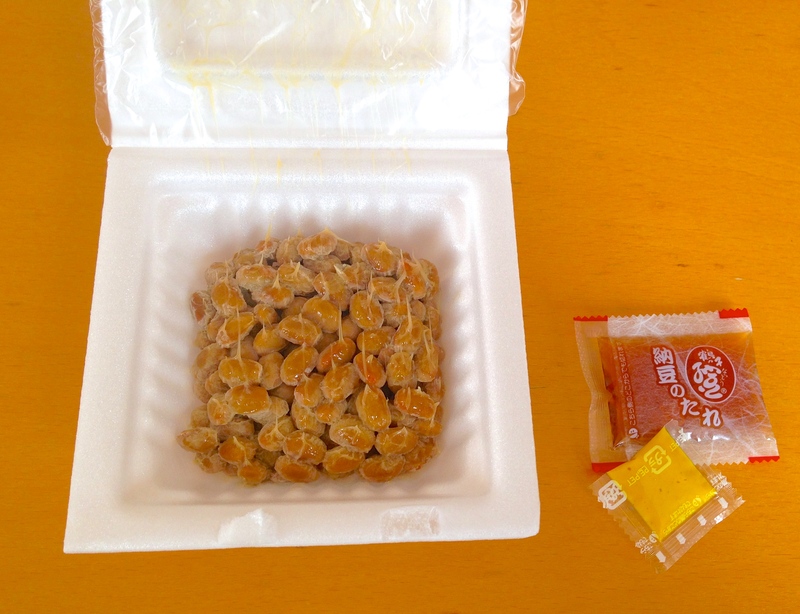 Open the package and you will usually see a pouch of sauce and mustard along with the Natto. Transfer Natto into a small bowl and stir until it becomes gooey and threads. Add the sauce (and the mustard to taste) to the bowl and mix. If there is no sauce, you can drizzle with soy sauce. You can also add some Dashi stock to taste. When you add mustard or some chopped green onion, the Natto’s smell is reduced. When you add some Tofu or steamed rice to Natto, the gooey texture is reduced. I want you to try eating Natto once. And if you like it, I highly recommend eating one pack of Natto a day. If you don’t like it very much, you can get similar nutritions from Tempeh instead. Categories: Super Food | Tags: Antibacterial effect, Bacillus subtilis var. Natto, Bactericidal effect, enzyme, fermented, gluten free, good quality protein, Nattokinase, Probiotics, Soybean, vegan, Vegetarian, Vitamin K | Permalink. Japanese Sweet Ginger Beef is popular around my hometown area, the Kansai region, which is in the west part of Japan. It is also popular in the Kyushu region. The seasonings are soy sauce and sugar, and I also use ginger to get rid of the beef smell and to make the dish flavorful so it is salty-sweet. 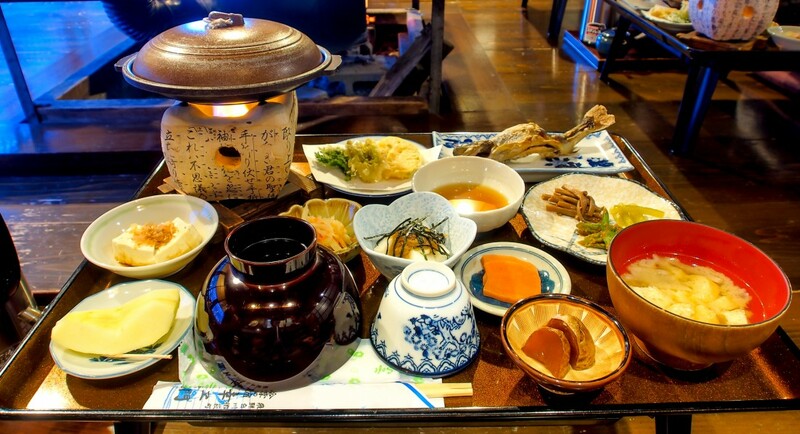 It is a typical traditional, but incredible tasty, Japanese dish like Teriyaki!! 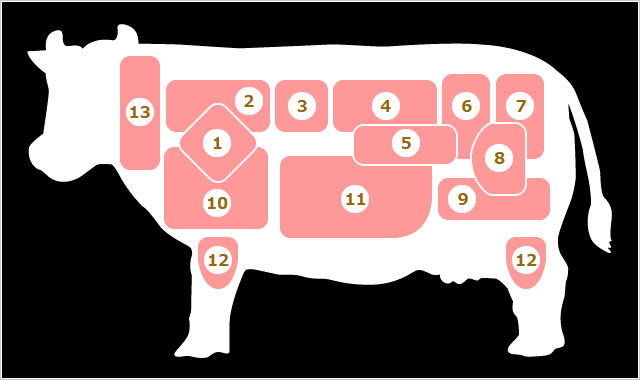 We use fibrous beef meat for the dish which is called beef shank in English (Number 12 in the picture). Shank meat is high in good protein, vitamin B12, and vitamin K. it is also low in fat and cholesterol. The meat is hard by itself, but when it is simmered slowly, it becomes very tender and flavorful, and it makes great beef broth too! This dish takes a little bit of time to prepare, but it is easy and simple. You can use this sweet ginger beef as an ingredient in salad, pizza, hamburger, and so on. Enjoy this healthy beef dish! Categories: Beef | Tags: Delicious, Easy, Ginger, gluten free, Healthy, Homemade, Japan, low cholesterol, Low fat, Nutrition, protein, Traditional, Vitamin B12, Vitamin K | Permalink.